Terror in Charlottesville, Part 2: Cornel West, Rev. Traci Blackmon & BLM Activist Jalane Schmidt | Democracy Now! professor of the practice of public philosophy at Harvard University. executive minister of Justice and Witness Ministries of the United Church of Christ. an organizer with the local Black Lives Matter movement and an associate professor of religious studies at the University of Virginia. Watch Part 2 of our roundtable discussion of the white supremacist violence in Charlottesville, Virginia, this weekend that led to the death of three people and injured many more. We speak with Jalane Schmidt, an organizer with the local Black Lives Matter movement and an associate professor of religious studies at the University of Virginia; Cornel West, professor of the practice of public philosophy at Harvard University; and Rev. Traci Blackmon, executive minister of Justice and Witness Ministries of the United Church of Christ. 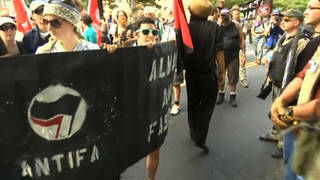 For more, we’re joined by three people who were there protesting the white supremacists. We are joined by Jalane Schmidt, who is an organizer with the local Black Lives Matter movement and associate professor of religious studies at the University of Virginia. In New York, Dr. Cornel West is with us, professor of the practice of public philosophy at Harvard University. And in St. Louis, we’re joined by Reverend Traci Blackmon, executive minister of Justice and Witness Ministries of the United Church of Christ. All of the were in Charlottesville this weekend. Now, Professer Jalane Schmidt, you had security. Why do you have security, personal security, at the University of Virginia? How long have you had it? JALANE SCHMIDT: Well, for the weekend of this Unite the Right rally, yes, I did have 24-hour security, and I didn’t stay in my home. I stayed in a safe house. And I did this because I’ve been identified by various figures in the “alt-right,” I’ve been identified publicly, and I was advised by, you know, kind of more experienced activists, leaders and organizers that I should take extra precaution this weekend. So I did. AMY GOODMAN: And how did Black Lives Matter organize for this weekend? JALANE SCHMIDT: Well, I mean, just through meetings, getting together and also doing preparatory trainings in nonviolent direct action so that we could prepare ourselves for the eventuality of possibly being assaulted. And so this was—and also training for responding in live gunfire situations. So we had both sorts of training. AMY GOODMAN: I wanted to go to Traci Blackmon to get your response to the number of Republican leaders who have spoken out against President Trump’s refusal to single out white supremacist violence. The Colorado Republican Senator Cory Gardner said, “Mr. President–we must call evil by its name. These were white supremacists and this was domestic terrorism.” The Republican Florida Senator Marco Rubio said, “Very important for the nation to hear [President Trump] describe events in Charlottesville for what they are, a terror attack by white supremacists.” Republican Utah Senator Orrin Hatch said, “We should call evil by its name. My brother didn’t give his life fighting Hitler for Nazi ideas to go unchallenged here at home.” Reverend Blackmon, your thoughts? REV. TRACI BLACKMON: Well, I appreciate the fact that these Republican leaders have spoken out against this incident in Charlottesville. But again, I want to caution against making it just about this one incident. Those same Republican leaders have, time and time again, promoted policy that alienates the other. Those same Republican leaders have promoted policy that emboldens the idea that white Americans are under threat and that other Americans do not deserve some of the same things that white America has. And so, while I applaud their words, that are direct, and I still expect the president of the United States to be a leader and to speak to this, to this issue, I also caution against not paying attention to the actions of even those Republican leaders where it matters, when they are instituting policy. The ban against immigrants, the healthcare reform bill, those things that have been situated to target people, the trans ban, all feed into the moment that we saw in Charlottesville and that we will continue to see across this nation if our leadership does not denounce white supremacy outright. AMY GOODMAN: Professor Cornel West, there’s word that the attorney general, Jeff Sessions, will open an investigation into what happened, Jeff Sessions who was fiercely opposed by so many with civil disobedience against his approval even to be attorney general, particularly around his position on African Americans and African-American disenfranchisement. Your thoughts? CORNEL WEST: Well, I mean, Jeff Sessions, he’s part of the problem. You know, to ask him to engage in investigation is like asking a wolf to somehow oversee the plight of the lambs. AMY GOODMAN: Jefferson Beauregard Sessions himself, his first two names are named for Confederate generals. CORNEL WEST: Oh, absolutely. He comes out of a legacy of white supremacy so deep. And, of course, he’s tried to make his efforts, and we appreciate it, but to think that somehow he’s got moral credibility on this issue, I think, is ludicrous, is laughable. I think we have to be very clear about what we’re up against. The crucial thing is, we’ve got to be able to unify, come together, fortify the efforts against the neofascists, against the big money, against massive militarism and especially against the xenophobia that highlights the most vulnerable. The most vulnerable among us are trans of color. And then, from there, you’ve got the poor. From there, you’ve got immigrants, especially brown, indigenous peoples, black peoples, working people and, of course, women and so forth. But to be very clear about the vulnerable ones. And I say this just as a—following the biblical imperative, what you do to the least of these, the prisoners and so forth. AMY GOODMAN: Jalane Schmidt, I wanted to turn to what’s happening in Charlottesville. You’re quoted in The New York Times saying some 52 percent of the residents of Charlottesville and surrounding Albemarle County, 14,000 people in all, were enslaved during the Civil War, that some 52 percent of the residents of Charlottesville—that’s at the time—enslaved. JALANE SCHMIDT: Yes. At the time of the Civil War, the outright majority of our community here in Charlottesville and Albemarle County was enslaved. That is true. And that’s why some of us have been organizing to remove these Confederate statues, because these statues lie to us on a daily basis, from the very central gathering places of our community. Neither Generals Lee nor Stonewall Jackson ever came to Charlottesville. And it’s a testament to the perverse success of these monuments to misrepresent our past that so few people knew prior to this process, or still know, that the majority, the outright majority, of our community at the time of the Civil War was enslaved. And, in fact—I mean, if any general deserves to be in a central place, it would be General Sheridan, who rode in on March the 3rd, 1865, and liberated the slaves in the area. And we have many accounts, documented accounts, from Union soldiers who were part of the liberating forces of the Union army about the responses of enslaved persons and how jubilant and relieved and grateful they were. That’s—that was the majority opinion. That was the majority response to the end of the Civil War in Charlottesville, not these two generals that never even came here, so that this is part of our struggle, is to unearth the narrative and revise the narrative that’s been—that we tell each other, that we’ve been told about our community. AMY GOODMAN: And can you talk about those who are opposed to the removal of these statues? I mean, you’ve got the Robert E. Lee statue that’s going to be removed, General Robert E. Lee. You now have the park, Lee Park, renamed Emancipation Park, and Jackson Park renamed Justice Park. But those who say, even some people of color, that you should remember the past, that however ugly it is, it should not be erased? JALANE SCHMIDT: Yes. So, there are a range of people who would prefer to maintain the statues in place, everybody from, you know, the neo-Nazis and KKK and “alt-right” folks who were here this weekend to the folks I call the kind of bow-tie racists—I mean, you know, the kind of people who are, you know, attorneys with the local bar association or historical preservationists or this sort of thing, who support keeping these monuments for various reasons, for reasons of historical preservation. You mentioned some elderly African-American residents. This has been much exaggerated, I must say, this cadre of people. They do exist, certainly. African Americans are not a monolith, as are no people. But that is a small minority that white officials who prefer to keep the statues like to use as what I call a black fig leaf, in order to represent so-called black opinion. It is not the majority opinion. And so, these folks that make the argument that we need to keep the statues in order to, you know, kind of not sandblast or, you know, airbrush our past, you know, in a kind of like Soviet version of history where, you know, you’d see a picture of the politburo one year, and, you know, there’d be all these individuals, and then you’d see a picture from the next year, and, you know, the person would be airbrushed out. So this is the argument that these preservationists make, that you’re just trying to airbrush history. As I’ve already mentioned, this history is a lie. It was revisionist history from the very time of the installation of the statues in the 1920s. It covers up our history. And to say that this—these statues can switch from being kind of laudatory history, as they are intended to be, to now being sort of a cautionary tale, a reminder of the Jim Crow past, is still to have these statues in place for the benefit of white folks. You know, what was kind of first a sort of whitewashed history, a sort of Lost Cause history that effaced the painful violence of slavery—you know, this was the—as these monuments had been put in—would now be cast as sort of a cautionary tale about racism and white supremacy. But I, as an African American, and other people of color and other vulnerable populations, we do not need a daily reminder of our oppression. We get plenty of reminders of—you know, daily monumental reminder, that is. I get plenty of reminders in other ways, with microaggressions and just the sorts of structures that are set up that minimize the contributions and value of the lives of people of color. AMY GOODMAN: He said that’s why they voted Trump into office. Again, David Duke. I want to go to that SOT of Donald Trump, during the campaign, being questioned by CNN’s Jake Tapper about the support of Klan leader David Duke. DONALD TRUMP: Well, just so you understand, I don’t know anything about David Duke. OK? I don’t know anything about what you’re even talking about with white supremacy or white supremacists. So, I don’t know. I mean, I don’t know—did he endorse me, or what’s going on, because, you know, I know nothing about David Duke. I know nothing about white supremacists. And so, when you’re asking me a question, that I’m supposed to be talking about people that I know nothing about. JAKE TAPPER: But I guess the question from the Anti-Defamation League is—even if you don’t know about their endorsement, there are these groups and individuals endorsing you. Would you just say, unequivocally, you condemn them, and you don’t want their support? DONALD TRUMP: Well, I have to look at the group. I mean, I don’t know what group you’re talking about. You wouldn’t want me to condemn a group that I know nothing about. I’d have to look. If you would send me a list of the groups, I will do research on them, and certainly I would disavow if I thought there was something wrong. JAKE TAPPER: The Ku Klux Klan? DONALD TRUMP: But you may have groups in there that are totally fine, and it would be very unfair. So give me a list of the groups, and I’ll let you know. DONALD TRUMP: I don’t know any—honestly, I don’t know David Duke. I don’t believe I’ve ever met him. AMY GOODMAN: Professor Cornel West, talk about what he was saying then, Spencer and Duke coming together this weekend, and where you think the movement against white supremacy goes from here. CORNEL WEST: I mean, we know that Donald Trump was lying. I mean, he’s been normalizing mendacity for decades. He knows about David Duke. He knows about white supremacists. He knows about the Ku Klux Klan and so forth. He knows that’s his social base. He brought in Steve Bannon, who’s very much a part of what people call the “alt-right” but is really just neofascism in contemporary garb. That’s why he brought in Bannon. So, I mean, the mendacity, of course, is on steroids when it comes to Donald Trump. But our concern has to be not fetishizing and giving him magical powers, but trying to empower those of us who are willing to fight. We need prophetic fightback, progressive fightback. It’s got to be multiracial, but it’s also got to be critical to capitalism and the empire, along with patriarchy and white supremacy. White supremacy certainly is at the center, but it can’t just be a matter of talking about race isolated from these other very ugly realities. AMY GOODMAN: And, Traci Blackmon, Reverend Blackmon, you left Charlottesville, went to St. Louis. Where do you think the media—the movement goes from here? REV. TRACI BLACKMON: The movement will continue to resist, as Dr. West just said. We will continue to resist this platform of hatred, this platform of isolation, this platform of othering people. It is something that we cannot—that’s what we talked about Friday night, before all of this broke down, that we cannot let hate win, that love must always trump hate. And I believe that that will be the case still. It has always been the case. It will continue to be the case. AMY GOODMAN: And, Professor West, this was called a Unite the Right rally. Do you feel that those opposed to white supremacy, across the political spectrum, have actually—are getting stronger or that this is a setback for movements, grassroots movements, here, as well? CORNEL WEST: No, I think that this is a massive awakening. We’ve already seen an awakening taking place in the last few years. It will intensify. We’ve seen marvelous demonstrations in a variety of different cities in the country, in the empire. We see young people seeing other young white supremacist young people, saying, “That’s my generation. I have got to be on the right side. I’ve got to be on the moral and just side.” So I think that we have to have a real sense of commitment to being a hope in such a bleak moment. And we can turn things around. CORNEL WEST: Yes, they did. Yes, they did. AMY GOODMAN: —young people who had come from all over to fight white supremacy. Can you end by talking about that? CORNEL WEST: Well, I just want to salute those young folk. They were courageous. They were willing to sacrifice. There we were, most of the clergy in their clergy garb, completely defenseless, would have been crushed, as I said, like cockroaches. To have the young people step in—and, yes, they were fighting, yes, they were reacting to the violence coming from the fascists—and to have anti-fascists coming together in that way also is a sign of hope. AMY GOODMAN: Finally, the image of the torches, the mainly young white men walking through the campus, only difference is not with hoods this time, but walking with their torches through the University of Virginia? CORNEL WEST: That it’s gone back to the Klan in the '20s, Kristallnacht in the ’30s in Germany, the Belgians in the Congo in the early part of the 20th century, the Turkish mistreatment of the Armenians and the Kurds. We've seen this all around the world. We just have to be fortified. We can’t just stay woke. We’ve got to stay fortified. AMY GOODMAN: Reverend Cornel West, Reverend Traci Blackmon and Professor Jalane Schmidt from the University of Virginia, we want to thank you all for being with us, all there this weekend. They witnessed the terror, the terror in Charlottesville. This is Democracy Now! To see Part 1 of our discussion, go to democracynow.org. I’m Amy Goodman. Thanks for joining us.